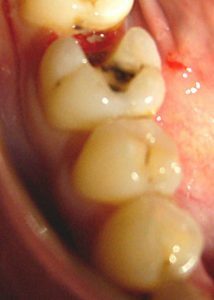 Large dental fillings may break under important or repetitive mastication forces. This can also lead to the fracture of the tooth itself, sometimes beyond repair. Onlays are a good way to restore a tooth and they are superior in terms of resistance than direct fillings. They are also more conservative than crowns. Treatment performed by Dr TL. Dental impressions are taken during the first appointment and the onlay is glued on the second appointment. Onlays can be made in gold or porcelain. 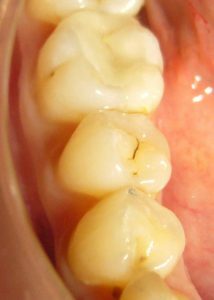 In this case, an Emax porcelain has been placed.